Atomic Structure : this animation shows a semi-classical view of an atom with a central solid nucleus and orbiting electrons. The electrons are shown as yellow spheres that are attracted to the dense nucleus. In "reality", electrons in atoms are more like standing waves but the old planetary model does have some uses (it is easier to visualize for a start). The nucleus, which consists of protons (shown in red) and neutrons (shown in grey) is shown with its particles heaving and moving. LEAD is a very heavy metallic element. It contains 82 protons (hence atomic number = 82) and 82 electrons and 125 neutrons. 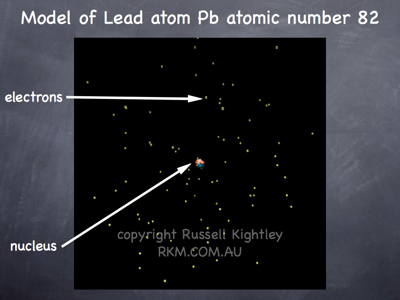 Lead was an important constituent in paint and petrol (leaded gas) but it is very toxic and is used much less nowadays. Lead poisoning is still a risk during home renovation when lead paint can be disturbed during sanding down.